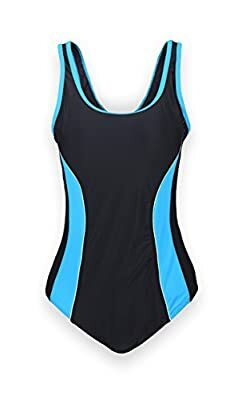 Nobody can resist the lure of swimming no matter in summer, spring, fall or even in winter because swimming is such an amazing thing that you can not only do exercise but also is a good chance to show your perfect figure. But it's difficult to stand out from others. Most people will choose bikini, so this one piece swimsuit will be eye-catching because it's such a different style. Shell:82% chinlon and 18% spandex, lining:95% terylene and 5% spandex. Hand wash only. Imported. U-neck and scoop back Solid with black stitch on both sides Removable cups for a convenient clean Secure fit, with elasticity About the detail of size info, please follow the Product Description.